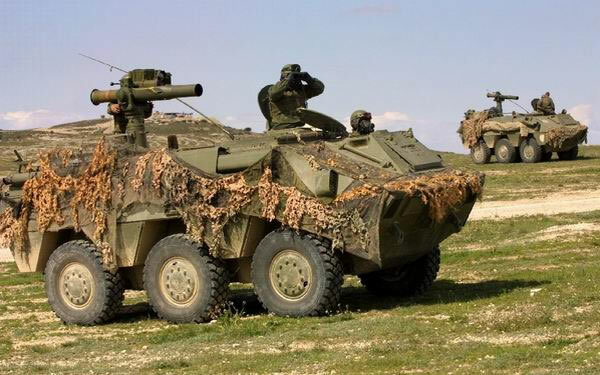 Thou some would call The Spanish BMR-600 AKA BMR 3560 Series (Blindado Medio de Ruedas) an Infantry Fighting Vehicle, it lacks the offensive and defensive armaments used by other IFV’s such as a turret housing a large calibre auto cannon such as a 30+mm or anti-tank missile systems as used on the Russian BMP series or US Bradley. It does however have a 12.7mm (.50) cal MG on the roof, which can be aimed and operated from within the vehicle (this should not be confused with the more modern Remote Weapons Stations used on the Stryker or Challenger 2). The vehicle was designed in corporation between the Spanish Army and the former Spanish company Pegaso. First prototypes were completed in 1975 with production commencing in 1979. Pegaso were the original manufacturer of the vehicle, but through various mergers with other European heavy vehicle manufacturers in the 80’s and 90’s, this landed with Santa Bárbara Sistemas who are now part of US Firm General Dynamics. BMR 3560.50 (BMR-PP) (Porta Personal) – Basic APC. Can be armed with machine guns .50cal M2HB, 7.62mm MG1A1 or an automatic grenade launcher 40mm LAG-40. BMR EDEX (Equipo de Desactivación de Explosivos) – Version for EOD teams with higher roofline and equipped with special boxes to transport explosives. BMR C/C MILAN – Tank hunter with MILAN ATGM. BMR C/C TOW – Tank hunter with TOW ATGM. BMR VCZ (Véhiculo de Combate Zapadores) – Combat engineer vehicle with light bulldozer blade and winch. 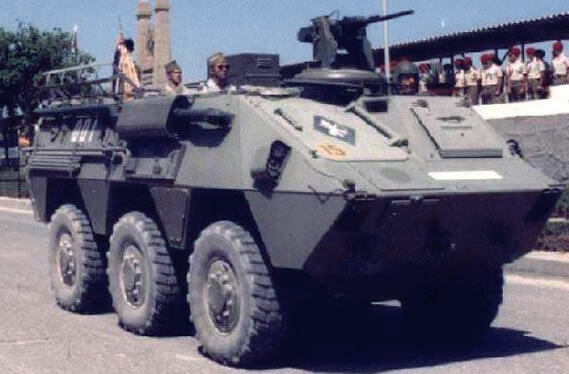 BMR VRAC-NBQ (Vehículo de Reconocimiento de Áreas Contaminadas) – NBC reconnaissance vehicle. BMR GEL (Guerra Electrónica) – Version fitted with specialised equipment for electronic warfare. BMR 3560.51 (BMR-PC) (Puesto de Control) – Command post vehicle. 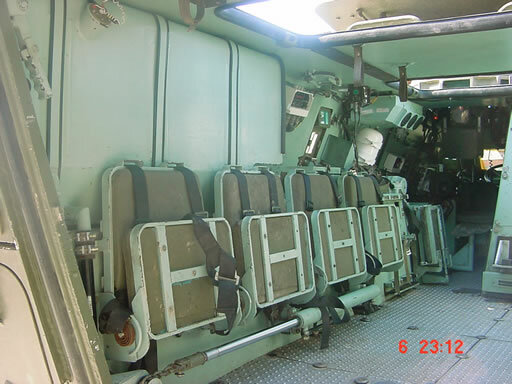 BMR 3560.53E (BMR-PM-81) (Portamortero) – Mortar platform with 81mm mortar LN M-86 and 100 rounds. BMR 3560.54 (BMR AMB) (Ambulancias blindadas ) – Ambulance. BMR 3560.55 (BMR-Recup) (Recuperación) – Light repair vehicle with crane, winch and tow bars. BMR 3560.56 – Signals vehicle. BMR 3560.57 – Tank hunter with HOT ATGM. Prototype. BMR 3560.59E (BMR-PM-120) (Portamortero) – Mortar carrier with 120mm mortar L-65. VMA (Vehículo Mecanizado Anfibio) – With improved amphibious capabilities. Prototype. Spain: 682 – original Pegaso engines replaced by new 310hp Scania DS9 61A 24S engines, as part of the “BMR 2” programme. Furthermore, the vehicles were fitted with additional passive armour and an air conditioning unit. They are now known as BMR M1. 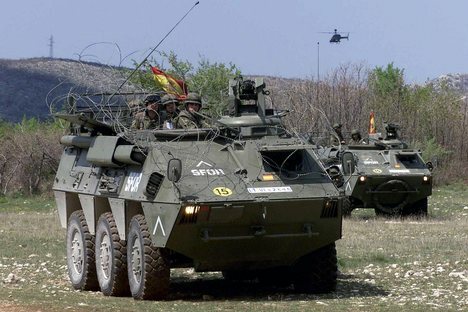 The Spanish Army has deployed the vehicle in support of its forces in hot spots, including the Balkans, Iraq (2003 onwards), Afghanistan and Lebanon.